Papagayo is a great home base for all sorts of activities in Guanacaste, but there is one adventure in Costa Rica you should not miss out on, whitewater rafting. We invite you to escape your beach resort for the day and head to the the river on one of our Papagayo Whitewater Rafting excursions. With a vast network of rivers crisscrossing the entire country, it's no wonder that river rafting in Costa Rica is unparalleled, and we've brought together some of the best rafting tours in Papagayo and the surrounding regions so that you can have the pick of the litter. Although there are no rafting rivers close to Papagayo, there are still a couple of rivers just a short trip into the mountains of Guanacaste that are well worth venturing out for. Looking for fast and furious fun? 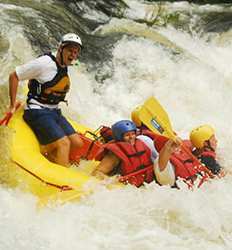 We suggest the more challenging Class III-IV rapids on our Tenorio River whitewater rafting tour. 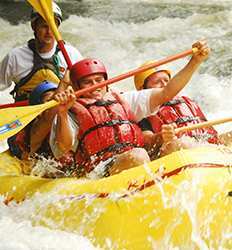 Not quite ready for the full whitewater rafting experience but still want to get a taste of the Costa Rica river experience? Try navigating your own "Duckie" raft down the Corobici River's class II-III rapids and finish your journey with a waterfall rappel! Click through our list of Papagayo whitewater rafting tours below for more information on all the different whitewater excursions we offer! Choose from the Colorado or Tenorio River rafting tours in Papagayo and get your adrenaline pumping! Whichever river adventure you choose, we are sure it will be a splashing good time!